I’m probably cheating a bit by starting with this picture but I know that one or two Chelsea fans read the blog who might be interested. Below you see Chelsea Football Club at a time before the many developments of recent years. It looks rather open and unadorned. 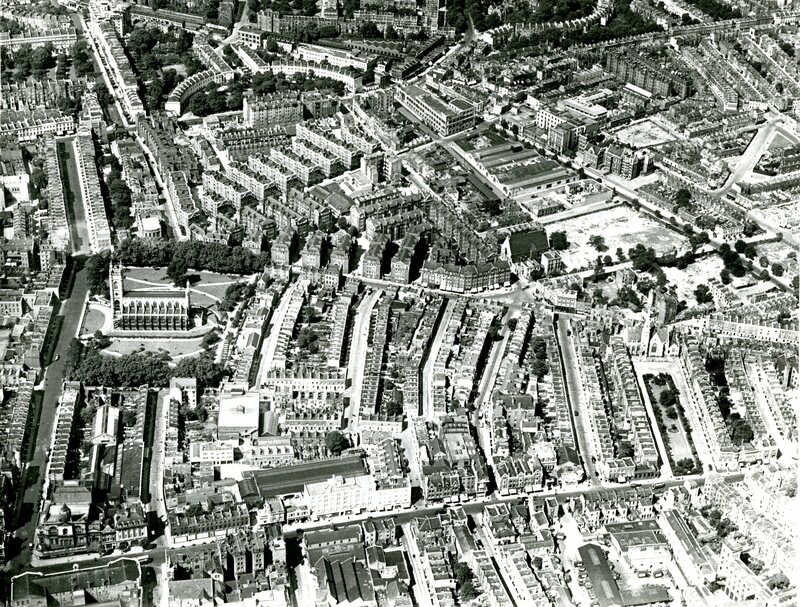 Part of Brompton Cemetery is visible at the top of the picture. 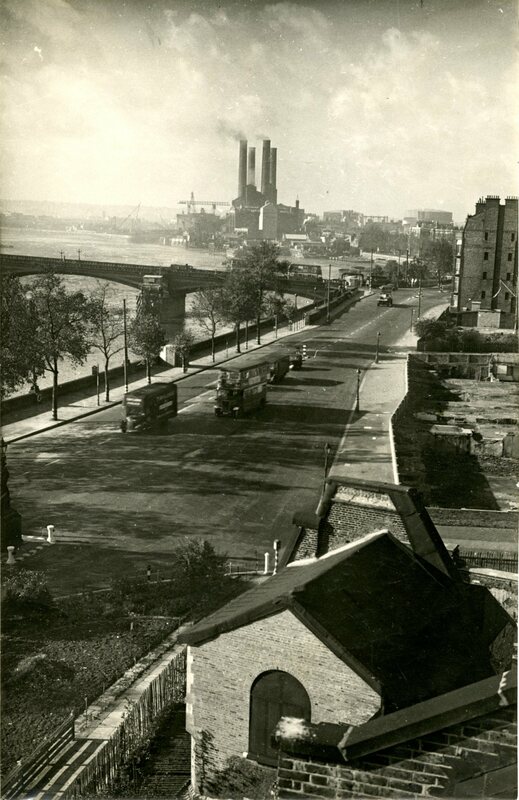 In this picture you can see Battersea Bridge and Albert Bridge, Chelsea Creek and Lots Road Power Station with a full compliment of chimneys pouring smoke into the air. I zeroed in on the area near the power station. You can see a few large barges moored between a pair of jetties, and then a building with a curved ramp, possibly some kind of parking structure which wouldn’t have been visible from Lots Road. 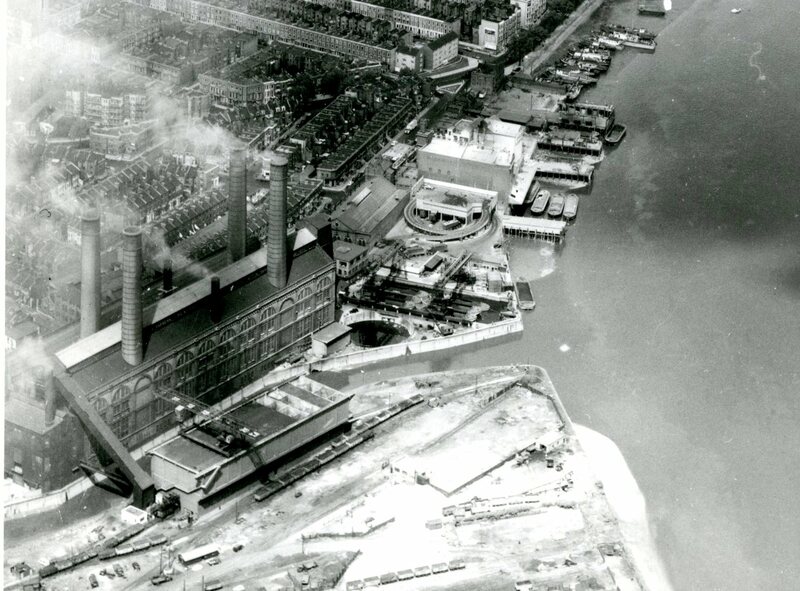 The Power Station is also visible in this picture, not a bird’s eye view exactly , more a view from a tower. 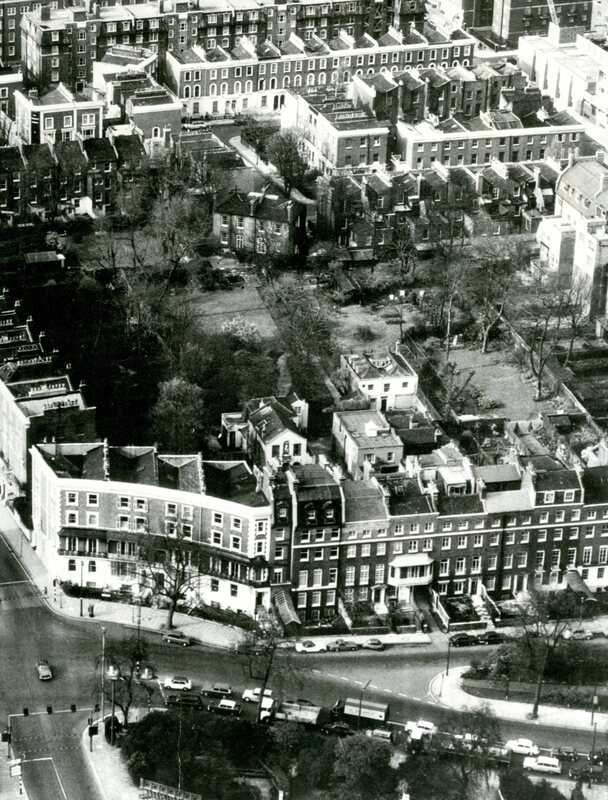 You can see the edge of the Chelsea Old Church site, and the walled off area which would become Roper’s Garden after some landscaping. This shows the church from the air. Roper’s Garden is still unfinished – it wasn’t completed until 1963. One of my predecessors has annotated this picture taking note of the crowd visible around the church and speculated that the date is May 1958, when the reconstructed church, badly damaged in World War 2, was re-consecrated. That sounds plausible. Near the top of the picture on the right you can see the Kingsley School, a classic early 20th century county school, which was used by ARP fire watchers as a vantage point during the war. They would have seen the bombs dropping on the original church. Right at the top you can just make our the rectory garden, one of the largest private gardens in London at the time, and the rectory itself which was photographed by James Hedderly. 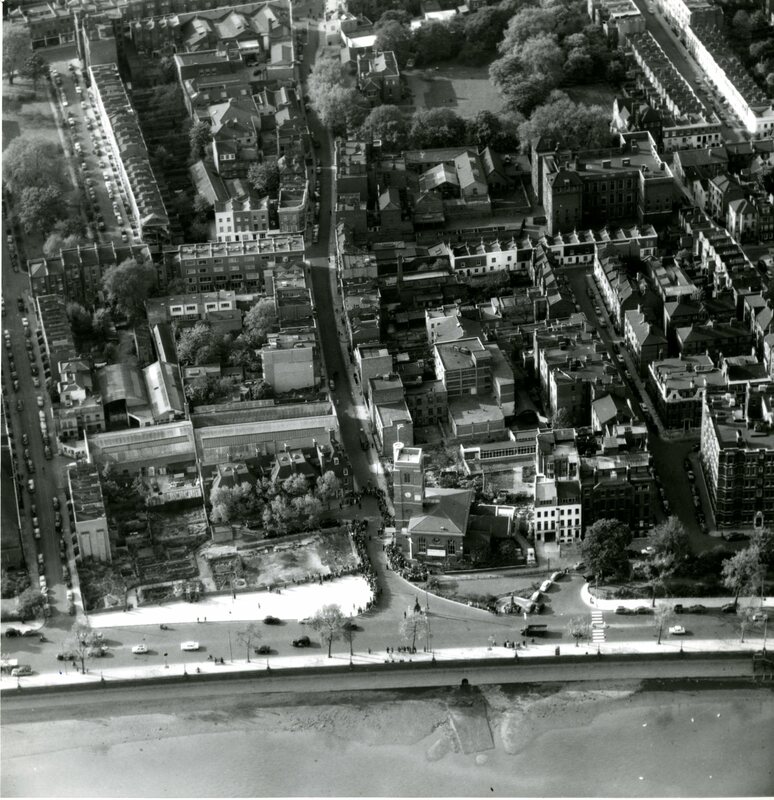 Another set of gardens is visible in this picture, further along Cheyne Walk. 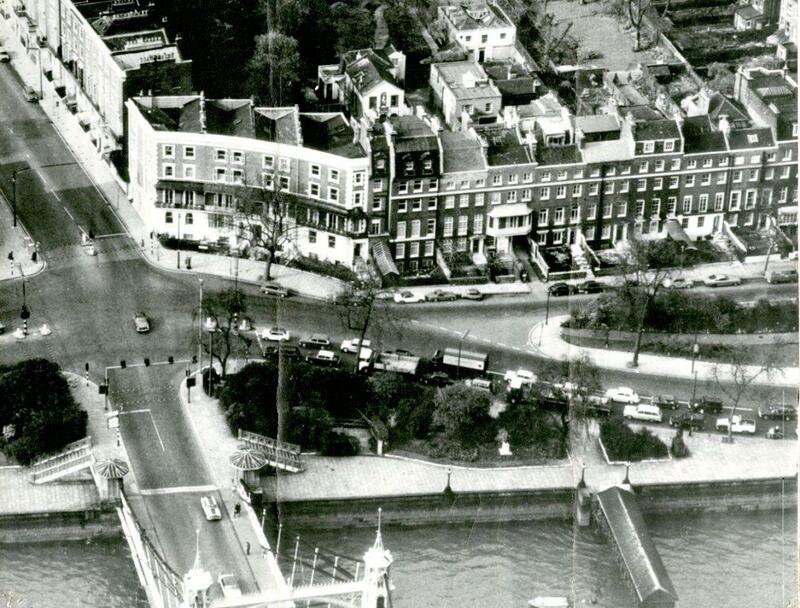 Albert Bridge is in the foreground and the end of Oakley Street. This is part of a large photograph which was too big to scan all at once. You can see a small part of the gardens behind the houses on Cheyne Walk but this section gives you a better view. You can just make out the Phene Arms at the top left of the picture. 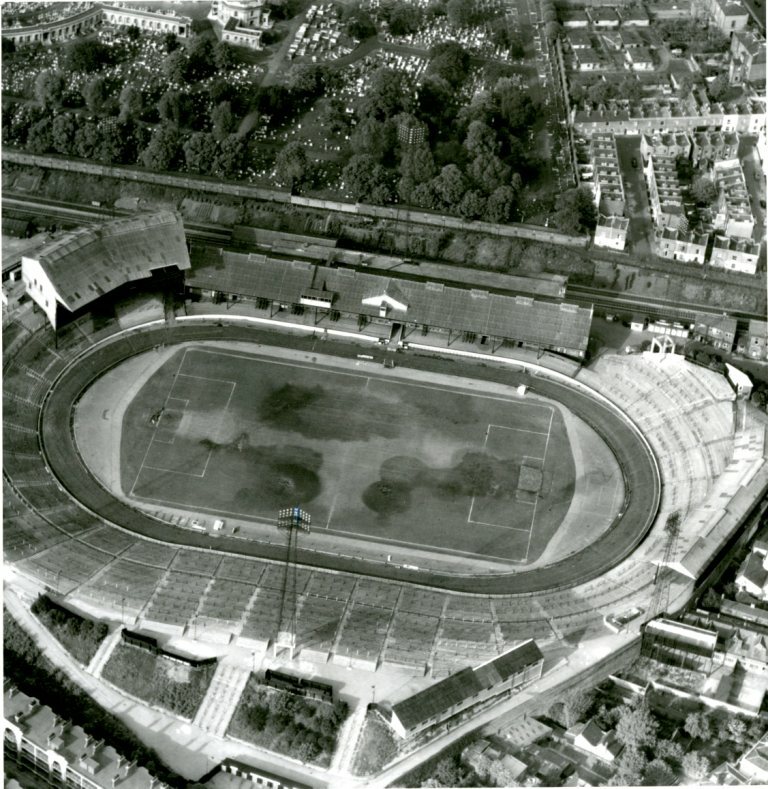 The trickiest kind of aerial picture to deal with are the top down variety like this one. I’ve left it uncompressed as with a couple of the others so if you click on the image you can see a bigger view. You can make out buildings such as Chelsea Old Town Hall, Swan Court, the cinema building where the smaller modern Curzon Cinema is, next to Habitat. The fire station with its practice staircase is on the left with the old burial ground layout of Dovehouse Green, the remnants of St Luke’s Hospital and the Thamesbrook old people’s home (built on the site of the former Chelsea Workhouse.) You can also see an empty site on the corner of Sydney Street where the Chelsea Palace music hall had been. A detail further along the King’s Road shows a large building where a number of lorries are parked. 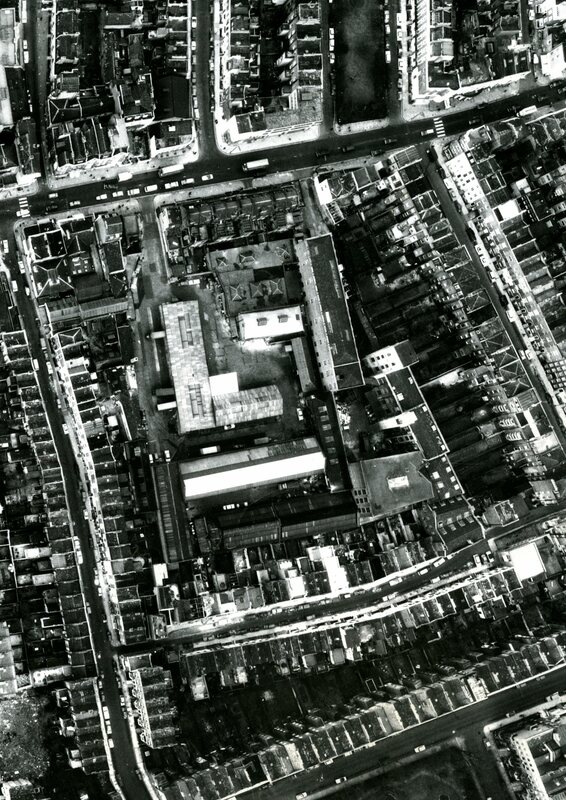 This is the area that was developed in the 1980s as Charles II Place, where there is now a car park, residential properties and fronting onto the King’s Road, Marks and Spencer. (Does anyone remember the short lived Gateway store which was there?). I think this is also the site of the Market which was featured in a Bignell post. Should we go back to St Luke’s Church? 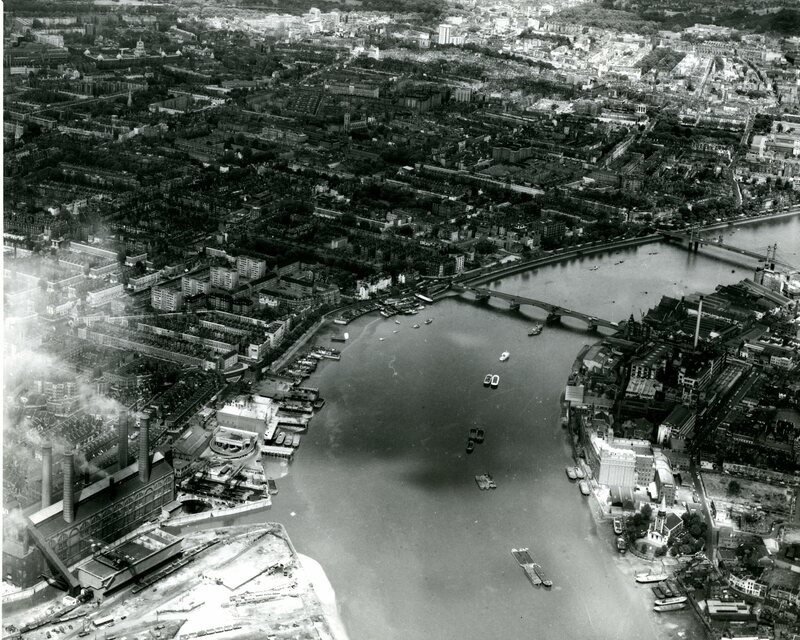 Another 1931 picture shows another empty site on the right of the picture. Click on the image to see a bigger version. The empty lot was where Cranmer Court. The series of long shed-like buildings next to it were demolished to make way for Chelsea Cloister. 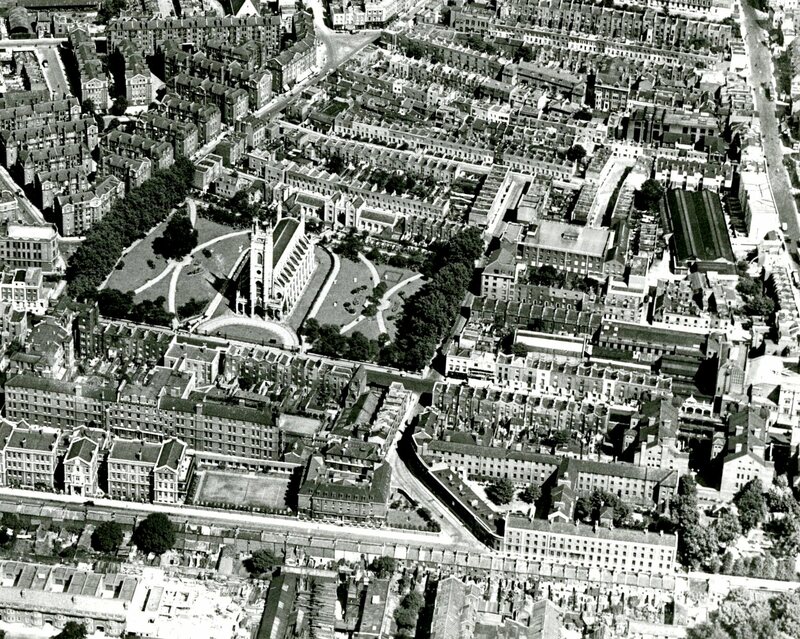 There was quite a lot of development in that part of Chelsea in the 1930s. 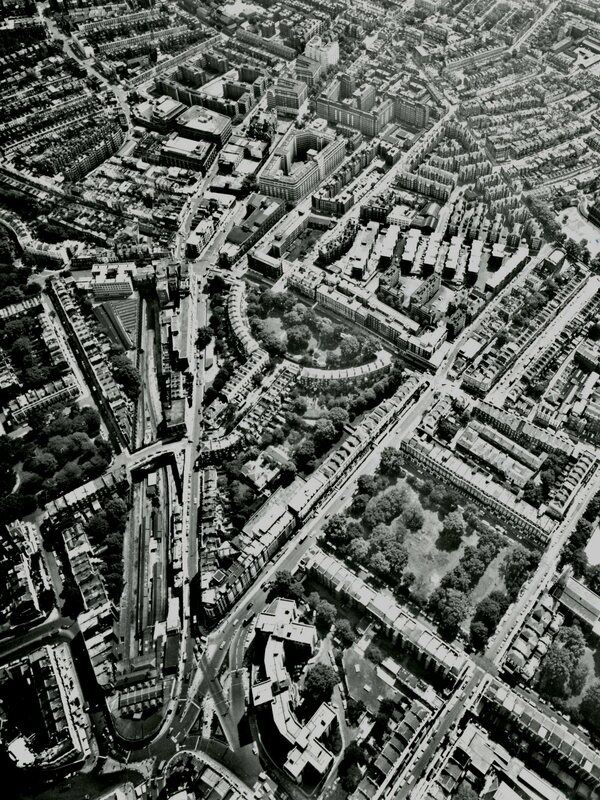 If you look in the bottom left hand corner you can see the Chelsea Palace years before its demolition. You get a sense of the broad sweep of the landscape in this picture but by zooming in you can see a few interesting details. 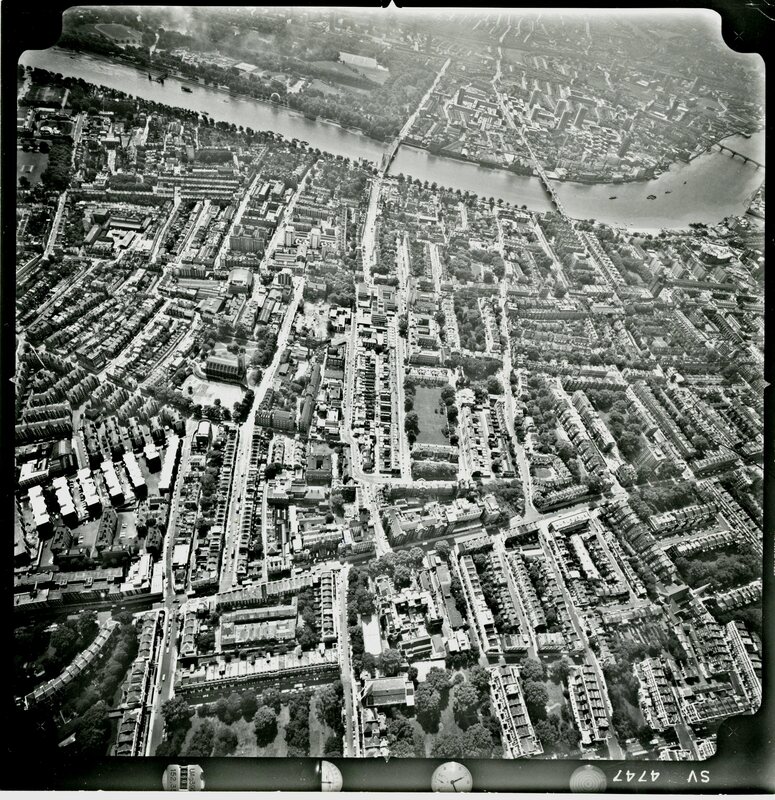 The Fulham Road crosses the picture near the bottom, That tall block with trees behind it is Elm Park House. 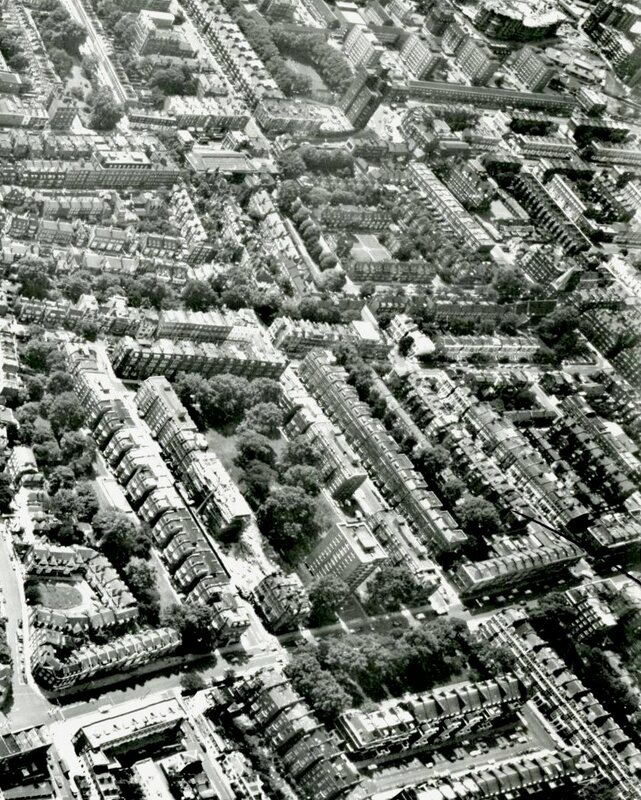 Around it are the apartment blocks of Elm Park Gardens. You can see that the gap between the block near to Elm Park House is much wider than it is today and there is scaffolding up on the blocks next to the gap. It looks as though there is still one more block to build which would put the picture at about 1970. This picture is further east but comes from the same set of images. 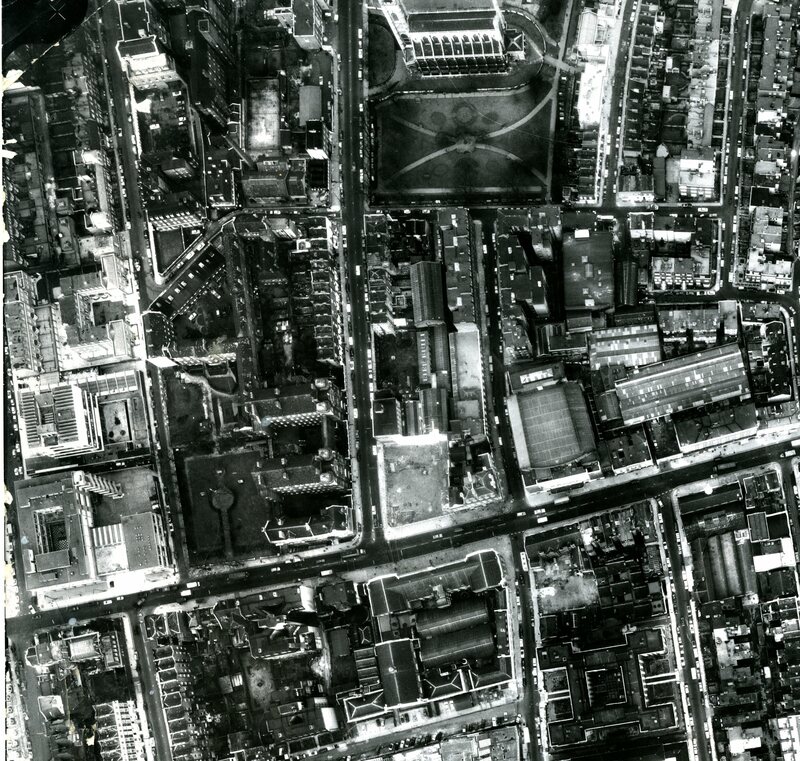 It shows South Kensington Station on the left of the picture with Pelham Street running alongside. I haven’t quite been able to decide if the buildings next to the tracks on the west are the ones I looked at in a previous post. Maybe. Further back you can see Chelsea Cloisters and Cranmer Court. In the centre foreground you see the strange curved shape of Melton Court. Opposite the station, at ground level, it looks like an innocuous apartment block but from the area you can see how the architect fitted it into its curved site. So that’s an odd selection of pictures looking down at Chelsea from various angles. It’s an acquired taste I suppose but I’m fascinated by these views from above. I’ve written about a few recent deaths this year, of people I never knew but just as last week’s post was published I heard about the sad passing of Richard Cavendish who was a regular user of the Local Studies Library. He was always good humoured and affable with the staff and it was a while after I first spoke to him that I realised that he was the author of a book called the Black Arts, a book about magic and witchcraft which I and many of my friends read avidly back in the early 1970s (what can I say – the occult was a bit of a thing back in those days). He was also one of the editors of the part-work encyclopaedia Man, Myth and Magic , which I collected in weekly parts. It was all a fascinating introduction to the world of strange phenomena and beliefs . I’m very glad I was able to tell him that I was one of his fans. This entry was posted on Thursday, November 10th, 2016 at 8:54 am	and posted in 20th Century, Chelsea. You can follow any responses to this entry through the RSS 2.0 feed. The building in Lots Road with the semi-circular ramps is K&C’s rubbish transfer station – dust carts drove up one ramp and down the other and dumped their loads down into ?bigger containers? ?sorters? (I have a crypto memory of long tables with sorters either side sifting the rubbish, but it may be wishful thinking). I think originally it was taken away by barges on the river. Dave, Concerning your doubt about the buildings “next to the tracks on the west” are actually on the picture. So I guess it’s them. Thanks for another nice bit of history.